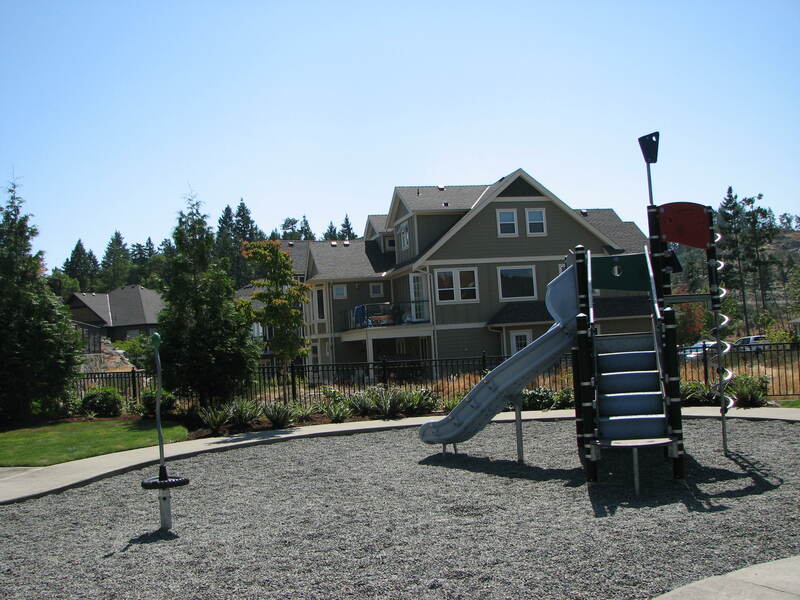 There are tons of parks in Langford, Colwood and View Royal. This listing is strictly in alphabetical order, not by location or how good the park is. The name for this park is a little unknown. 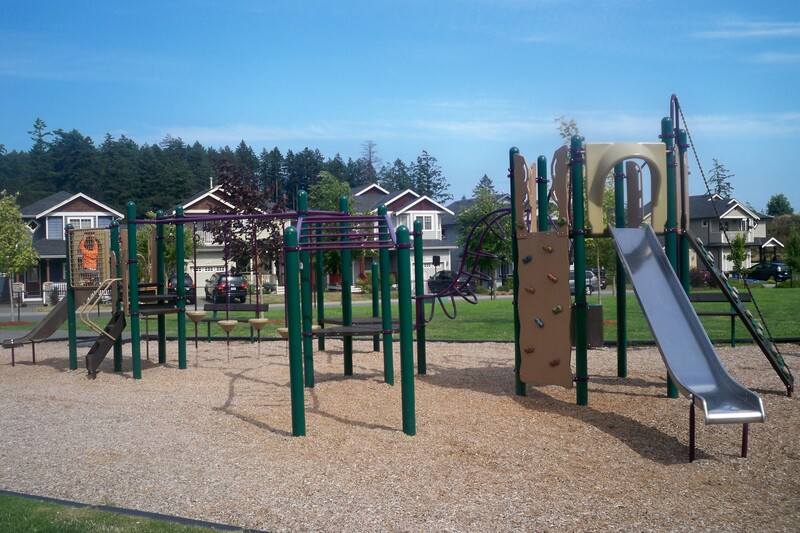 The City of Langford lists it as Centennial Park, but there is a sign at the park calling it Kinsmen Park, but everyone just knows it as Carlow Park because it is on Carlow Road in Langford, between Dunford and Goldstream. It is made up of three separate parks with lots of grassy areas between them. 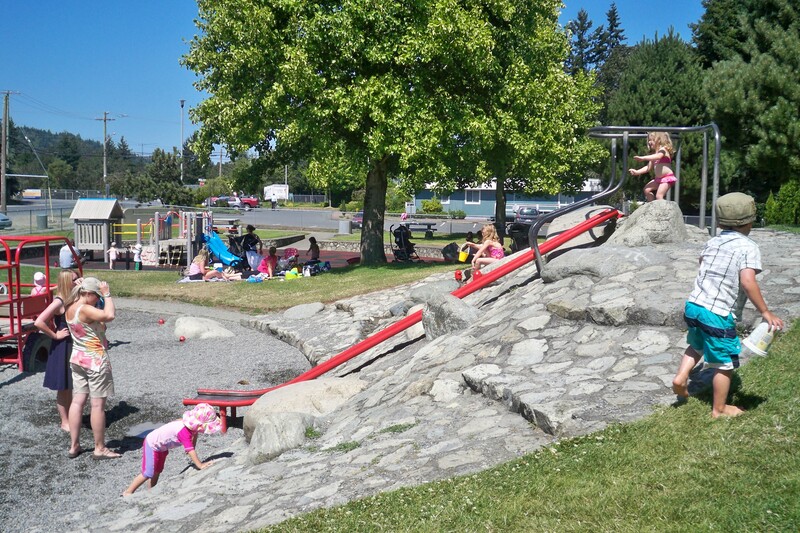 The parks are a toddler park (pictured first) with a double slide, play structure with a bridge and climbing options, 2 bouncy rides and a spinner bowl. This park is sunken into the ground so that the littler toddlers cannot escape! The middle park (pictured second) is a bigger kid park made up of a huge slide built into a manufactured rock slope, a bus climbing structure and a water park (very fun in the summer!). The last park area is an older wood structure that looks like there are parts missing from it, but the kids all seem to like it. There is plenty of parking off the street but it is close to a school so the parking spots get filled up fast during drop-off and pick-up times. 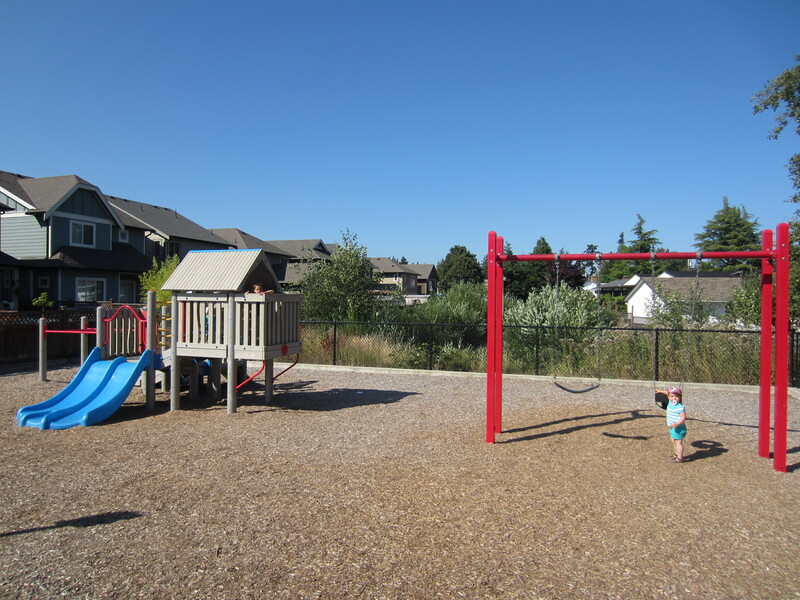 This playground is part of a huge grassy area with trails in Colwood (off Sunridge Valley Drive, then park at the end of Flannagan Place, very limited parking). The park is made up of 2 big kid swings and 2 baby swings. There is an awesome 4-person teeter-totter and 3 climbing structures. The first play structure is a wooden structure with lots of climbing options and a triple slide. The second structure is a taller plastic one with 2 bumpy slides. Then there is also a plastic climbing/balance type structure. This is a smaller neighbourhood park beside a large sports field. It is located on the end of Isabell Ave (off Happy Valley near Sooke Road) in Langford. This cute little park has a big kid swing and a baby swing. The play structure has a double slide, a bridge, a little hideout, a steering wheel and monkey bars. There is also a small 4-person teeter-totter type toy. There is plenty of parking directly in front of the park. 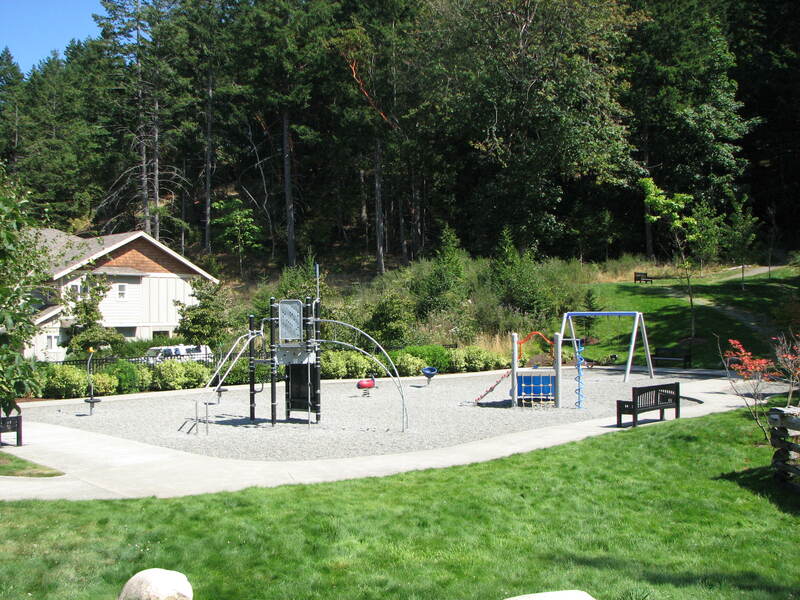 This tiny neighbourhood park is located on Ernhill Drive, off Jacklin near Sooke Road. From first appearances it looks a tad boring and outdated but kids seem to really like it. There are two swings (one big kid and one baby), a teeter-totter and a small vehicle play structure with a slide attached. It is in the middle of a small grassy lot and there is parking on the street. This is the first park in Bear Mountain (on Nicklaus Drive) and it is the main park. There are two swings (one of each), a spinner bowl, and two play structures. 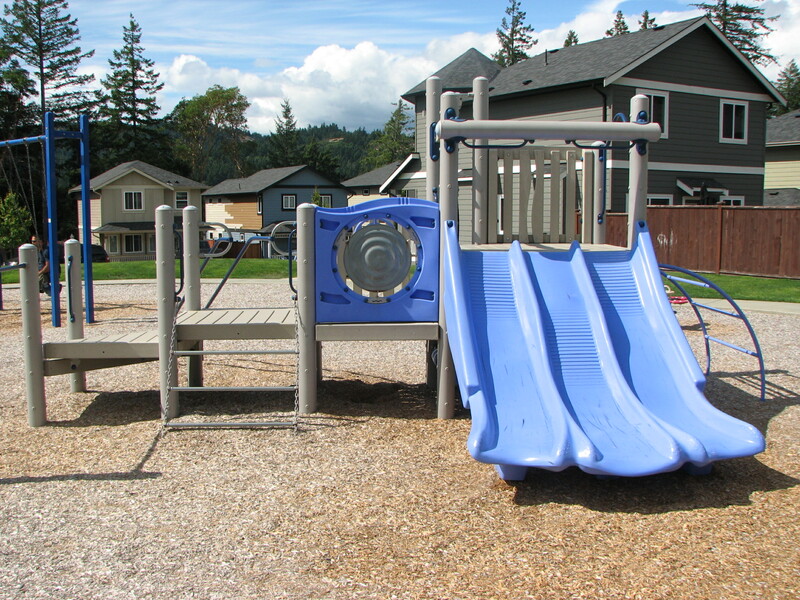 The toddler climber has three different climbing options to get up to the main structure where there is a double slide. The bigger structure has many crazy climbing options to get up to the main platform. This structure does not have a slide and is too difficult for our 4-year old tester to even figure out how to get to the top. The park is in a grassy area with parking on the street. 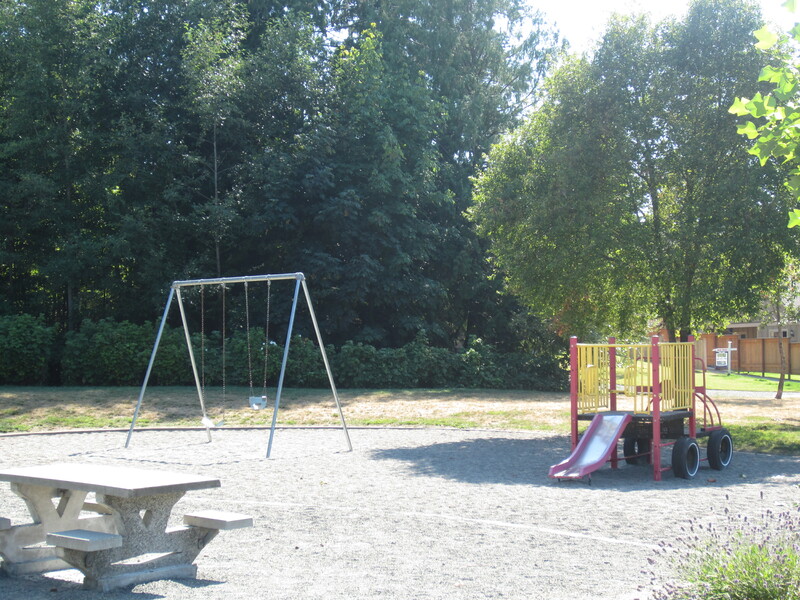 This park is located on Mary Anne (off Cairndale Road, off Veteran’s Memorial Pkwy in Colwood). There are many things in this park to keep kids interested. The main climbing structure has many ways to get up (none were low enough for our 20-month old tester to get up herself) and culminates in a choice of three slides. There are monkey bars, steps, a tunnel and crazy rock walls. If you look at the picture you’ll see a big gray structure in the background. We have no idea what this actually is but it’s some sort of climbing structure and looks like a lot of fun! The park has 2 baby swings and 2 big kid swings. Surrounding the park is a little forest area with trails and a lot of grassy areas. Parking is street parking and there seems to be quite a bit of it. This is the second park in Bear Mountain, located on Rockhampton Cl. It is a small park without any swings. It has a play structure with stairs or climbing options that ends with a tall slide. There is also a spinner stick and a teeter-totter that wobbles. For a small neighbourhood park our testers had a lot of fun at this one. 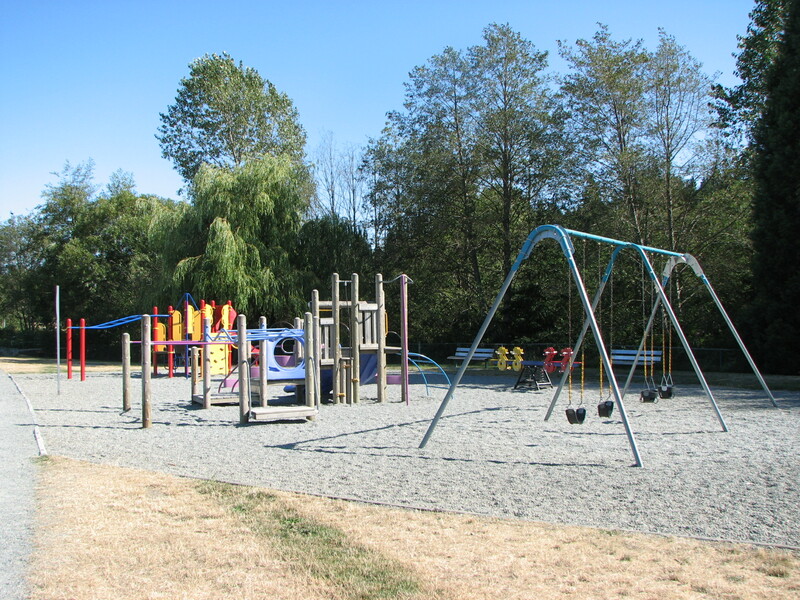 This large neighbourhood park is located in the middle of the Thetis Vale community (off Chilco Road). The park is on one side of a large grassy area and there are a couple parking spots near the field. 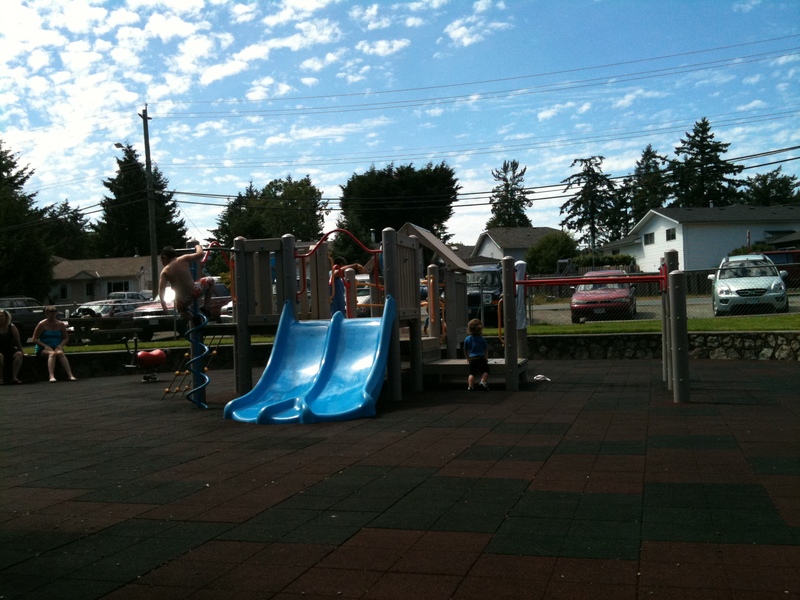 The park has two play structures and a set of swings (3 big kid swings and 1 baby swing). The smaller play structure has a set of stairs that lead up to a platform with a slide. There are also 2 climbing options to get up to the platform (a ladder type one and those wobbly mushroom step things) and a fireman’s pole. The larger structure has at least 5 climbing options to get up to the high platform that has a very high slide. 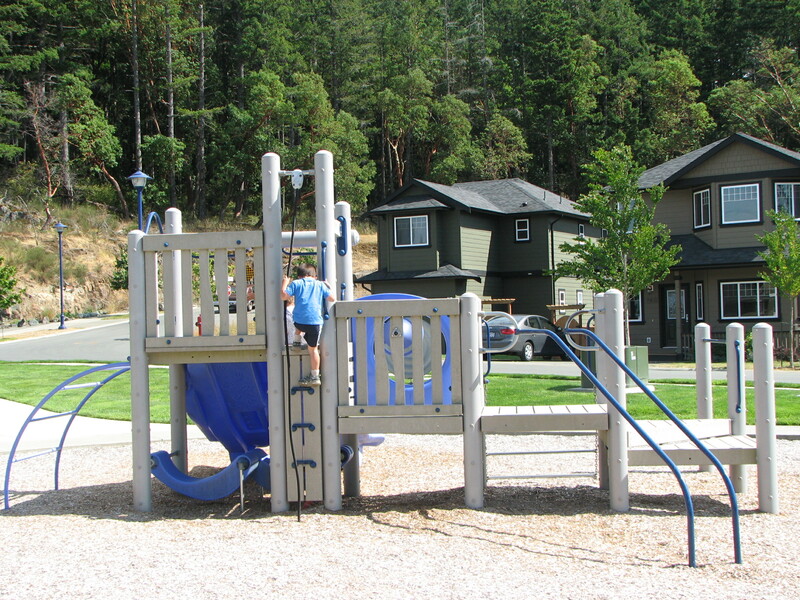 This neighbourhood park is located in Turnstone Estates (off Happy Valley Road). It is located in a small grassy area with a hill on one side (good for rolling down, apparently). The park has 2 big kid swings and 2 baby swings. There is also a spinner bowl, a 4-person bouncer and a play structure. 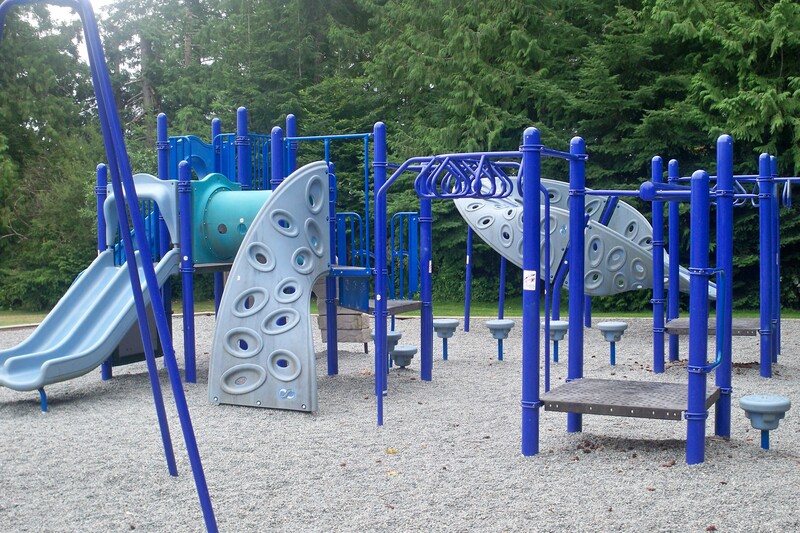 The play structure has a few different climbing options, suitable for all abilities and ages. There is a triple slide and a cute little hanging out area under the platform. Parking is street parking.